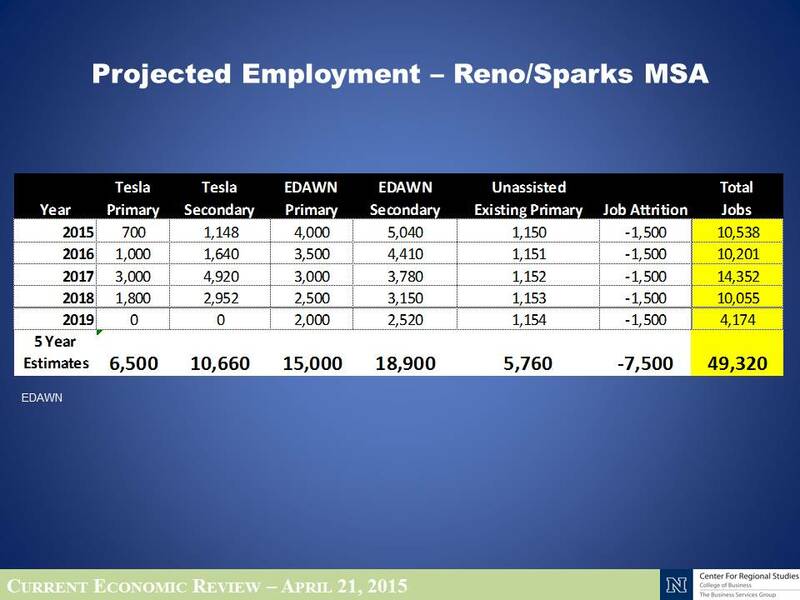 Center for Regional Studies (CRS) at the University of Nevada, Reno recently released an update of employment and wage information for the Reno-Sparks MSA and Washoe County (the difference between Reno-Sparks MSA and Washoe County is that the MSA includes both Washoe and Storey counties). 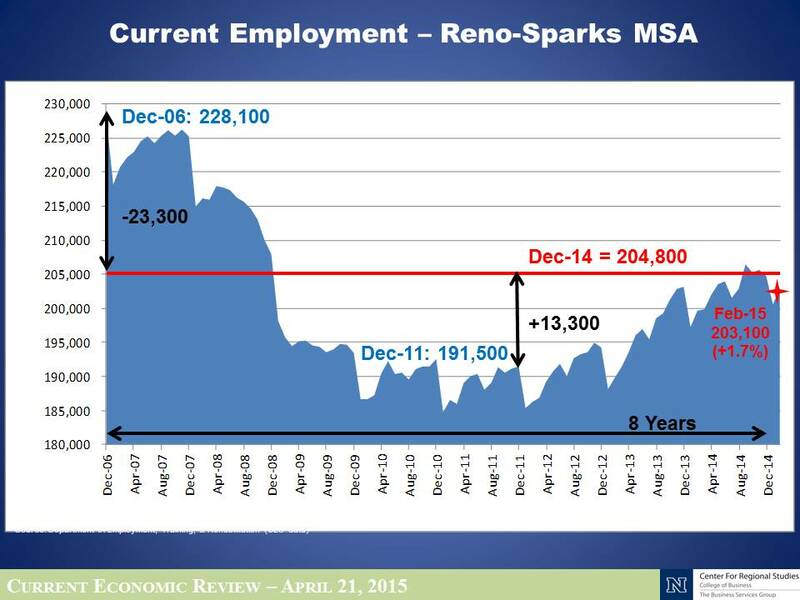 A graph summarizing employment data for the Reno-Sparks MSA is shown below. Due to seasonal fluctuations in monthly employment data, it is important to compare employment for the same month over multiple years. As December typically has the highest levels of employment, the below graph emphasizes results for December months across the study period (2006 to 2014). The highest level of December employment was in 2006 at 228,100 employees. December employment fell by over 36,000 jobs to its lowest point in 2011 (191,500). The MSA reached the highest level of December employment since the recession of 204,800 in 2014, gaining over 13,000 jobs between 2011 and 2014. While we are still approximately 23,000 jobs below the December 2006 level, this trend is encouraging. As of June 2015, year to date average employment increased by 4,700 jobs (2.4%) over the same period in 2014. 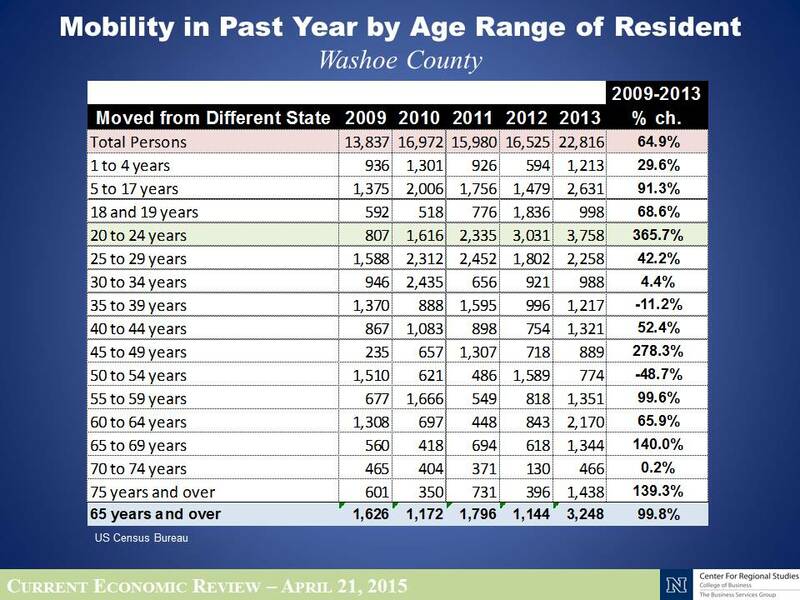 In terms of income and wages, CRS reported data for Washoe County on an annual basis between 2006 and 2014. The below graph shows countywide median household income peaked at $57,392 in 2008, before declining to $49,026 in 2012. Median household income is estimated for 2014 at $54,727, an 11.6 percent increase over 2012 levels and a 4.6 percent decrease since 2008. 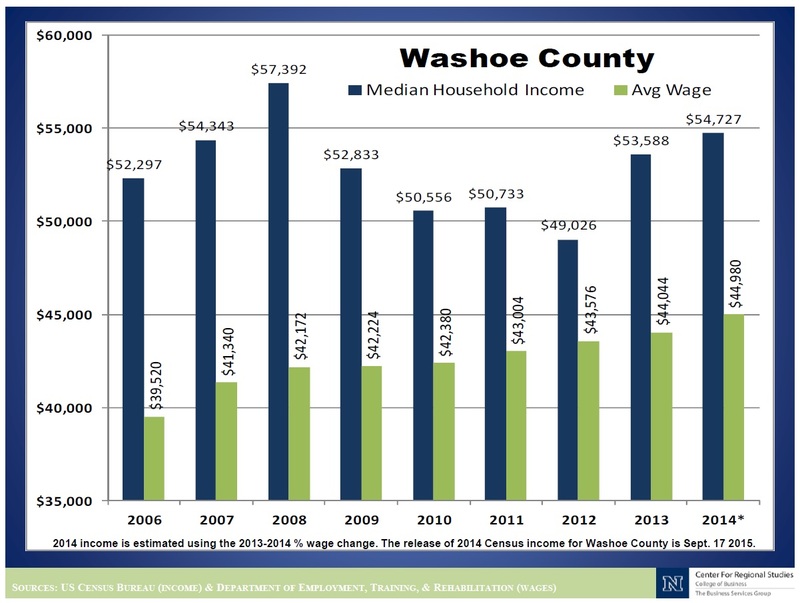 Average wages in Washoe County increased from $39,520 in 2006 to $44,980 in 2014, growing steadily over this period, with a total increase of 13.8 percent. While this is positive, wages are reported in nominal terms, unadjusted for inflation. Consumer price index for All items, West Size Class B/C as reported by the Bureau of Labor Statistics increased by 14.8 percent between 2006 and 2014. This indicates that wages are increasing at a rate below inflation. While this discrepancy still exists, it is lower than the difference between 2006 and 2013 wage and inflation growth. 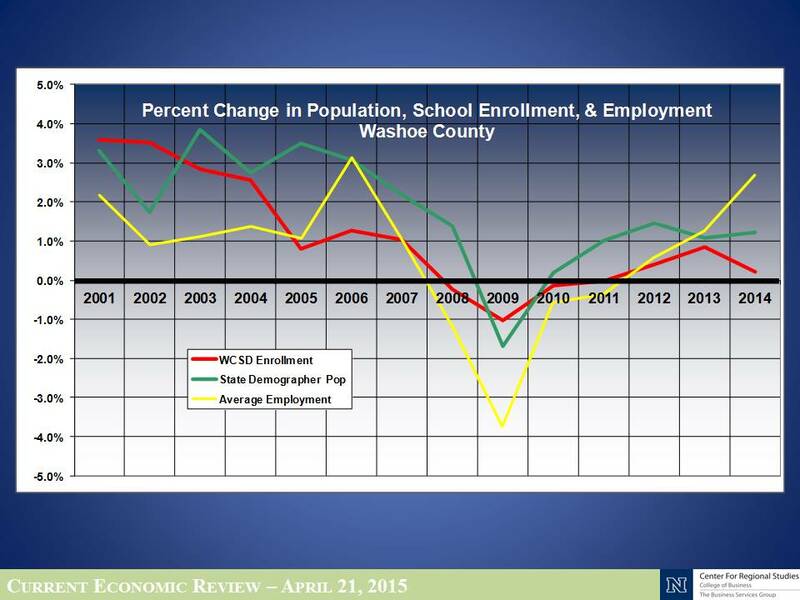 During this period, wages in Washoe County increased by 11.4 percent, while inflation increased by 13.3 percent, a difference of almost two percentage points. 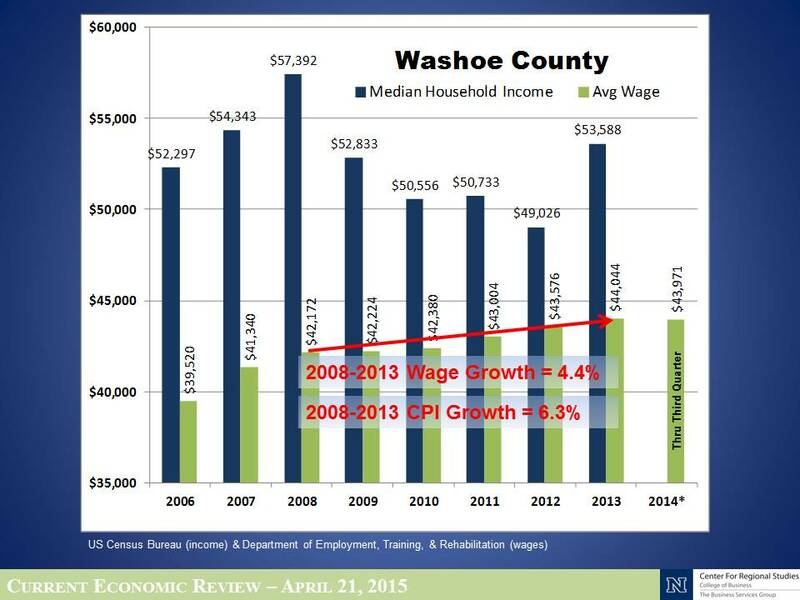 The difference decreased because for the first time since 2009, Washoe County wage growth in 2014 exceeded inflation, with wages increasing by 2.1 percent between 2013 and 2014, compared to inflation increase of 1.3 percent. Having missed the March indicator update, our April update combines information for the two months. Indicators for these periods would have included data for January and February of 2015. For some indicators, March 2015 data is also available and is also included in this entry. 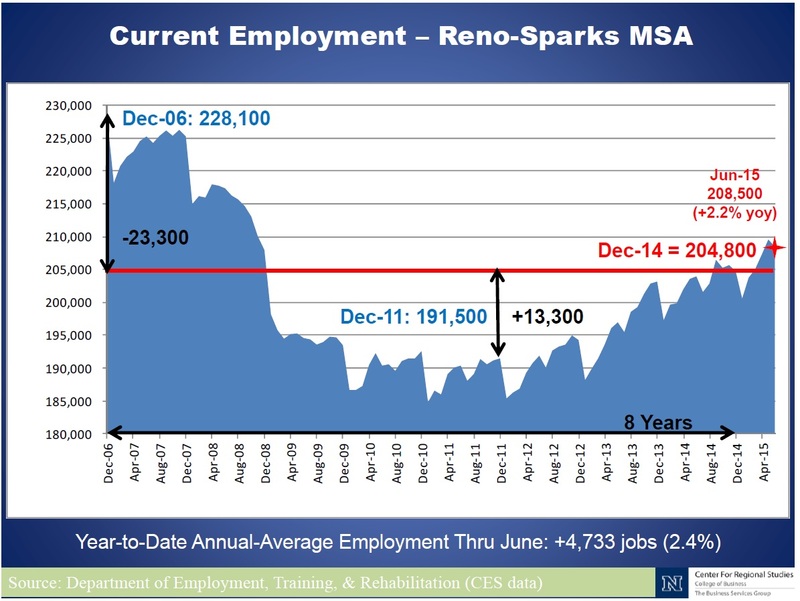 Monthly Reno-Sparks MSA employment trends (year over year) have seen consistent positive employment growth since March 2012. According to estimates from Department of Employment, Training, & Rehabilitation (DETR), January 2015 employment was 206,942, a 4.9% increase (9,600 jobs) over January 2014. February 2015 employment was 210,724, a 5.5% increase over February 2014 (11,000 jobs). March 2015 employment was 211,478, a 5.8% increase (11,600 jobs) over March 2014. The March 2015 employment level of 211,478 represents an increase of 26,700 jobs since the lowest level of employment post-2005 (January 2011, 184,800 jobs), but remains 16,600 jobs less than the region’s peak employment (December 2006, 228,100 jobs). Industries with the largest employment gains between March 2014 and March 2015 included Trade, Transportation, and Utilities (1,300 jobs), Education and Health Services (1,000 jobs), Leisure and Hospitality (900 jobs), Government (800 jobs), Manufacturing (700 jobs), and Construction (500 jobs). Industries with a reduction in jobs during this period were the Professional and Business Services (-100 jobs) industry; and Finance and Insurance (-100 jobs), Retail (-400 jobs), and Miscellaneous Manufacturing (-300 jobs) sub-industries. 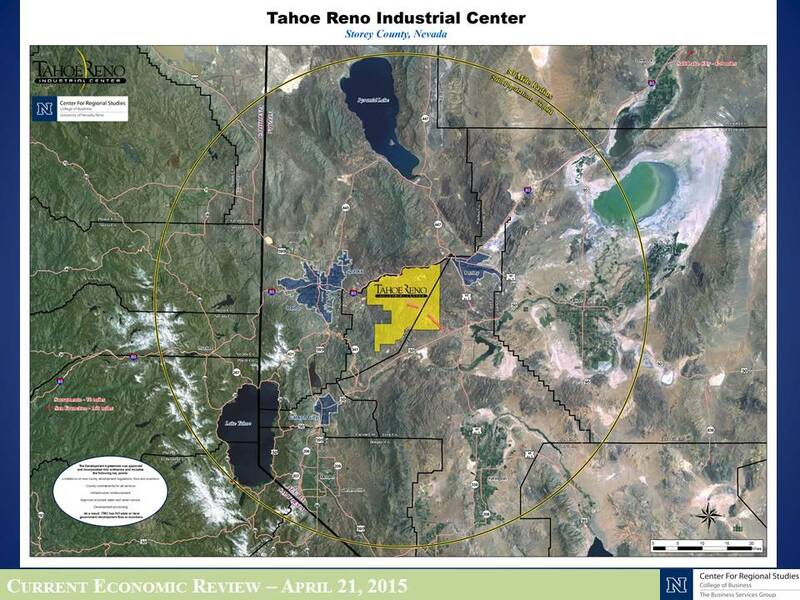 The Reno/Sparks MSA includes Washoe and Storey Counties. 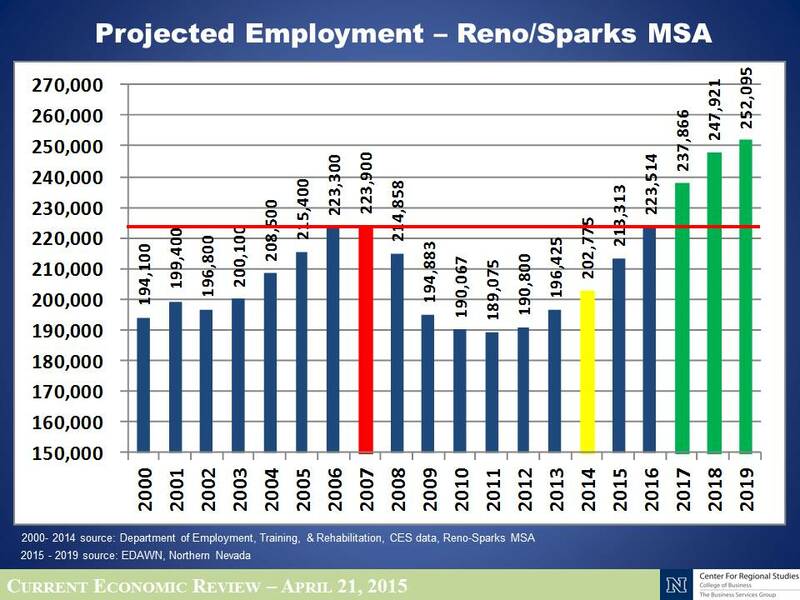 Despite the downturn in Washoe County gaming industry’s performance in recent years gaming remains an important employer and revenue generator. 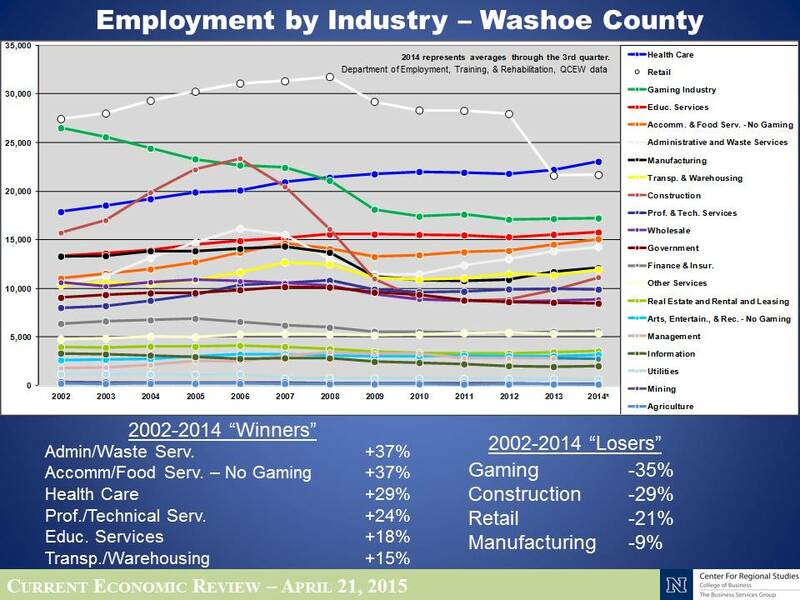 Of the top 20 employers in Washoe County, eight are Casino Hotels. Excluding government, school districts, and higher education, three of the top five employers are Casino Hotels. After six years of gross gaming revenue decline between 2007 and 2012 (year over year), gaming revenues increased in 2013 by 3.5% and in 2014 by 0.45%. 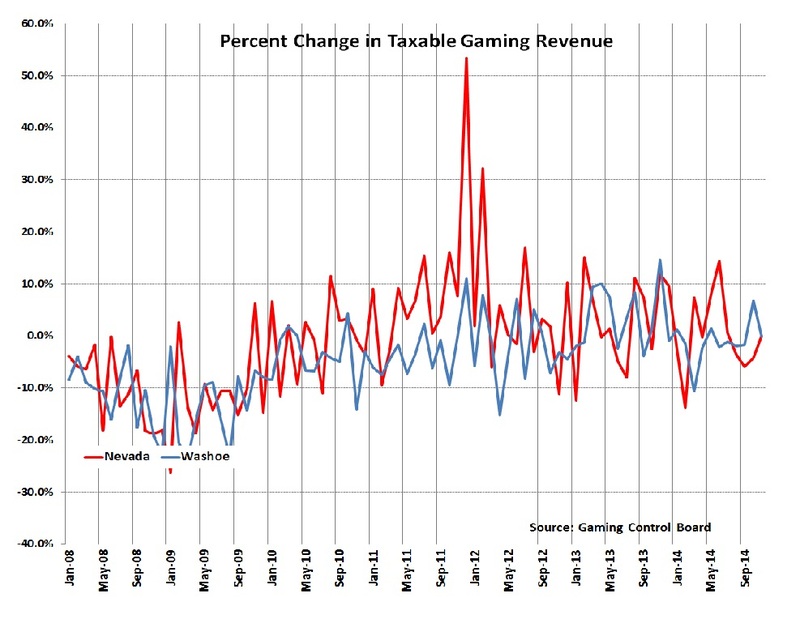 Gaming revenue increased by 12.4% between January 2014 and January 2015 and 3.4% between February 2014 and February 2015. With a 9% increase between December 2013 and 2014, we have experienced three consecutive months of gaming revenue growth. Through January 2015, Washoe County taxable sales have now experienced 25 straight months of positive year-over-year growth since January 2013. 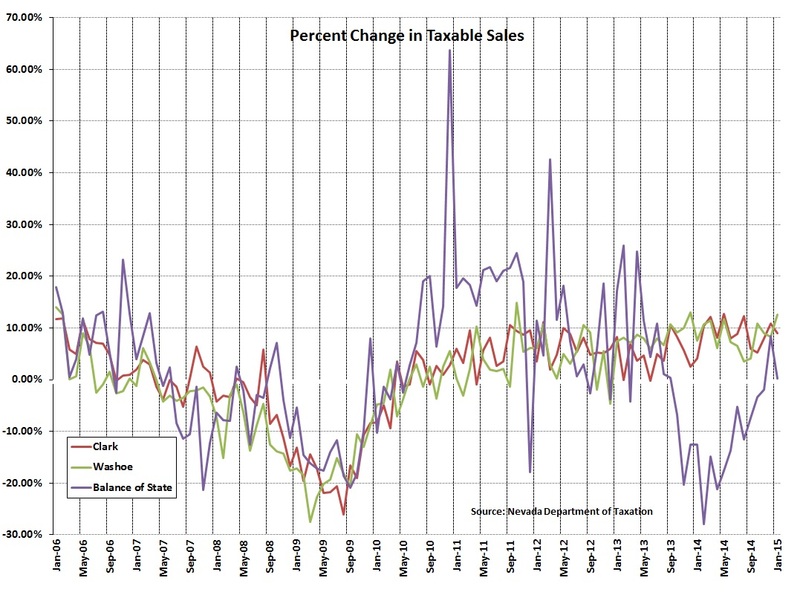 During this period taxable sales have increased between 3.6% (Aug-14/Aug-13) and 13.1% (Dec-13/Dec-12), with six of the months posting gains in the double-digits. 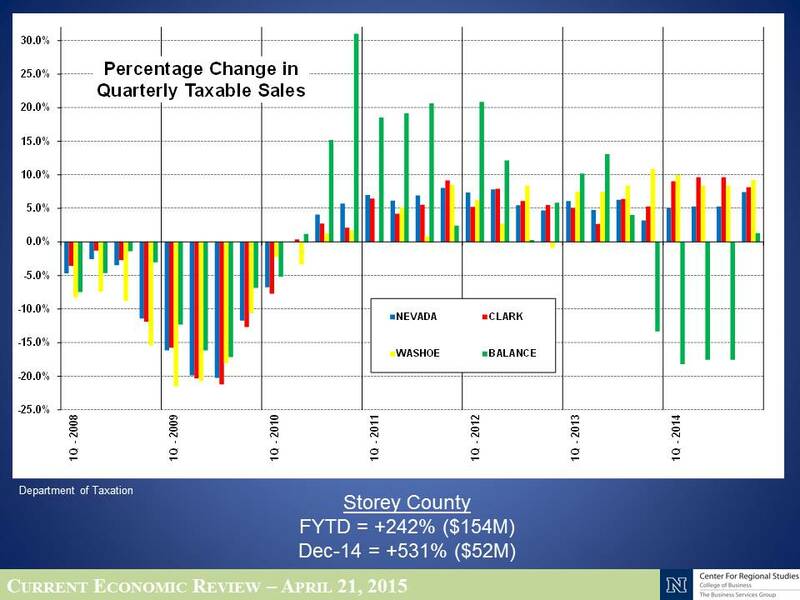 Between January 2014 and January 2015, taxable sales for the County increased by 12.5%. The industries with the largest portion of taxable sales in Washoe County continued to report growth in sales between January 2014 and January 2015. These include Motor Vehicle and Parts Dealers with sales of $72.7 million (21.0% increase), Food Services and Drinking Places with sales of $79.9 million (14.7% increase), and General Merchandise Stores with sales of $52.5 million (9.1% increase). 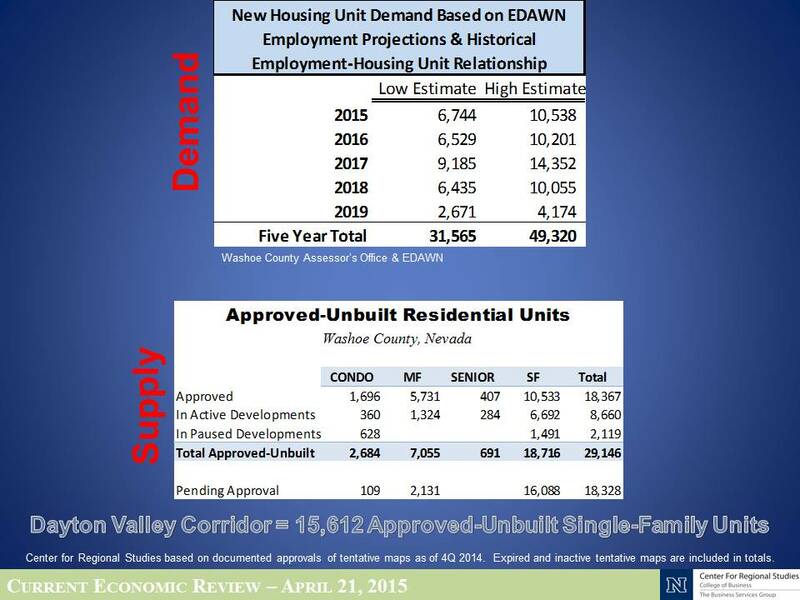 According to the Northern Nevada Regional MLS, the existing single-family median home value of $255,000 (January 2015) represents a 15.9% increase over January 2014, but a 3.8% decrease over December 2014 value of $265,000. December’s median value of $265,000 was the highest median since April 2008 ($275,000), but is still $95,000 less than the peak of January 2006 ($360,000). 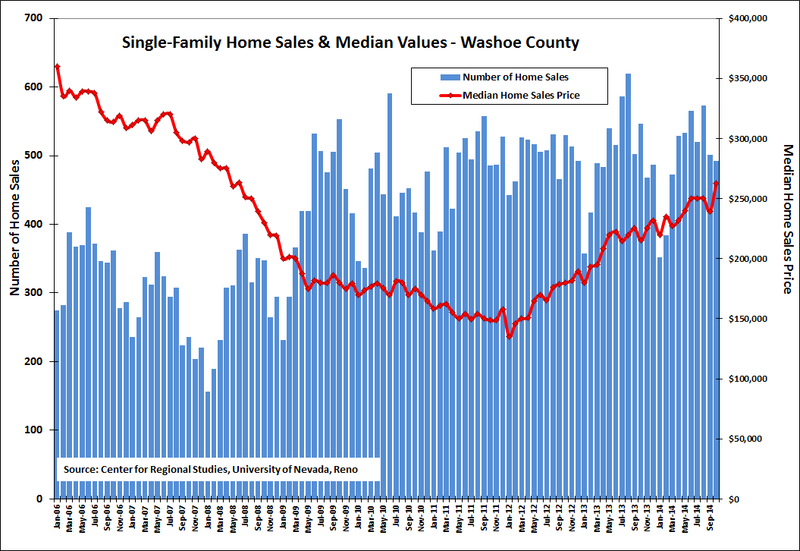 According to the Northern Nevada Regional MLS, 364 existing single-family homes were sold in the Washoe County in January 2015, compared to 352 homes sold in January 2014 and 514 homes in December 2014. 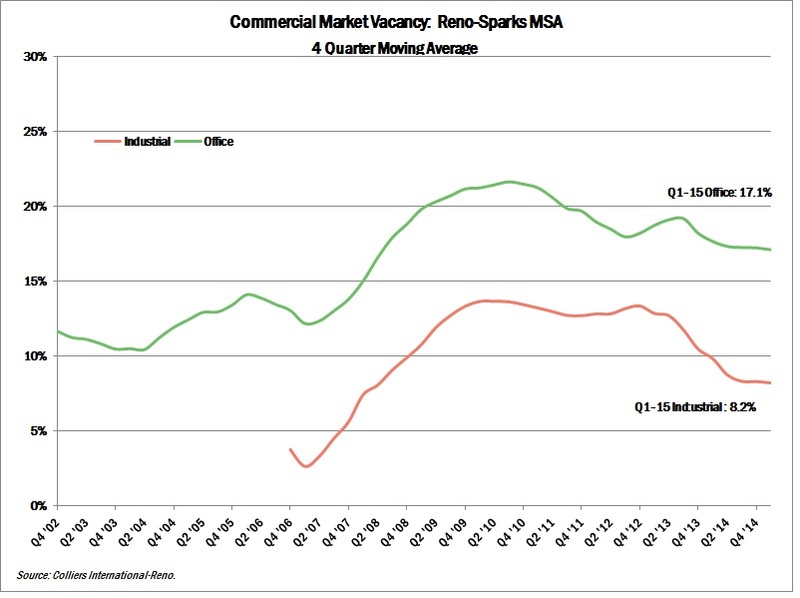 Using quarterly data available from Collier’s International Reno office, vacancy rates for office space are available starting in the 1st quarter 2002; vacancy rates for industrial properties are available starting 1stquarter 2006. As data are shown using a 4-quarter moving average (4QMA), the below graph shows office vacancy rates starting 4th quarter 2002 and industrial vacancy rates starting 4th quarter 2006. The office market vacancy rate peaked in the 3rd quarter 2010 with a 4QMA of 21.6%. Office vacancy rates declined to a post-recession low of 18.0% in the 3rd quarter 2012 before climbing to 19.2% by the 3rdquarter 2013. 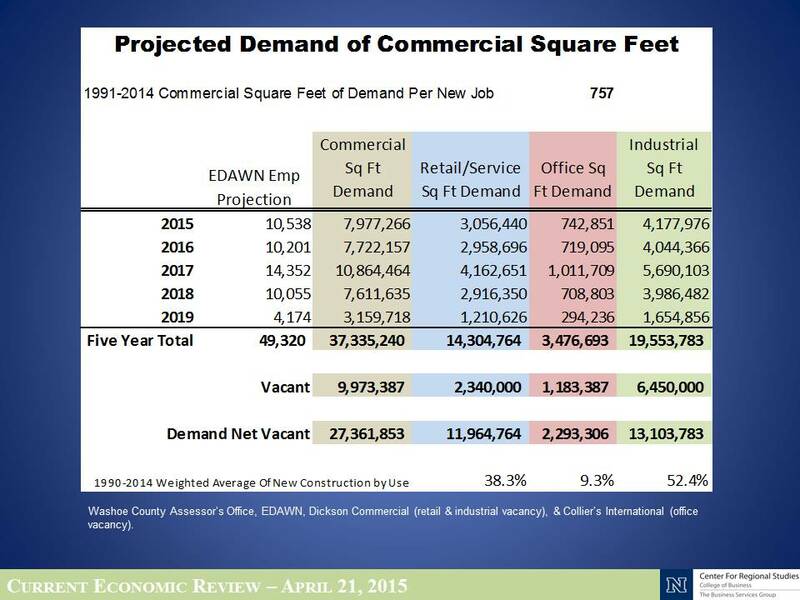 A year later, by the 3rd quarter of 2014, vacancy rates fell to a 4QMA level of 17.4%. 4QMA fell to 17.2% in the 4th Quarter of 2014 and 17.1% in the 1st Quarter of 2015. The industrial market vacancy rate peaked in the 2nd quarter of 2010 with a 4QMA level of 13.7%. Rates fluctuated during the next few years before reaching a new peak in the 4th quarter of 2012 with a 4QMA level of 13.4%. By the 3rd quarter 2014, 4QMA levels fell to 8.0%, compared to the 4QMA level of 11.8% a year prior, 3rd quarter 2013. 4QMA increased slightly to 8.3% in the 4th Quarter of 2014 before a slight decrease to 8.2% in the 1st Quarter 2015. 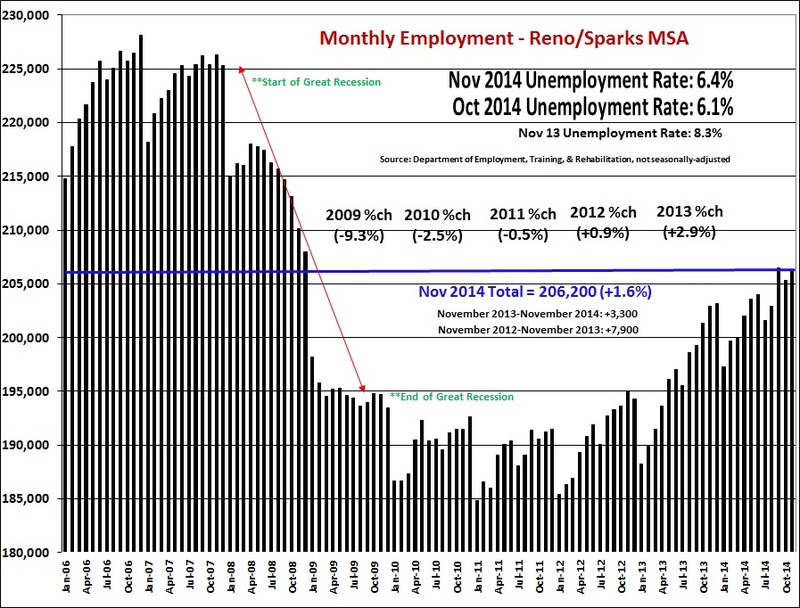 Monthly Reno-Sparks MSA employment trends (year over year) have seen consistent positive employment growth since March 2012. According to preliminary estimates from Department of Employment, Training, & Rehabilitation (DETR), December 2014 employment is 204,800, a 0.8% increase (1,600 jobs) over December 2013. The December 2014 employment is higher than for any December employment total since 2008, but the December 2014 employment is 1,700 jobs less than the peak in 2014 (September = 206,500) and 900 jobs less than November. The December 2014 employment level of 204,800 represents an increase of 20,000 jobs since the lowest level of employment post-2005 (January 2011, 184,800 jobs), but remains 23,300 jobs less than the region’s peak employment (December 2006, 228,100 jobs). 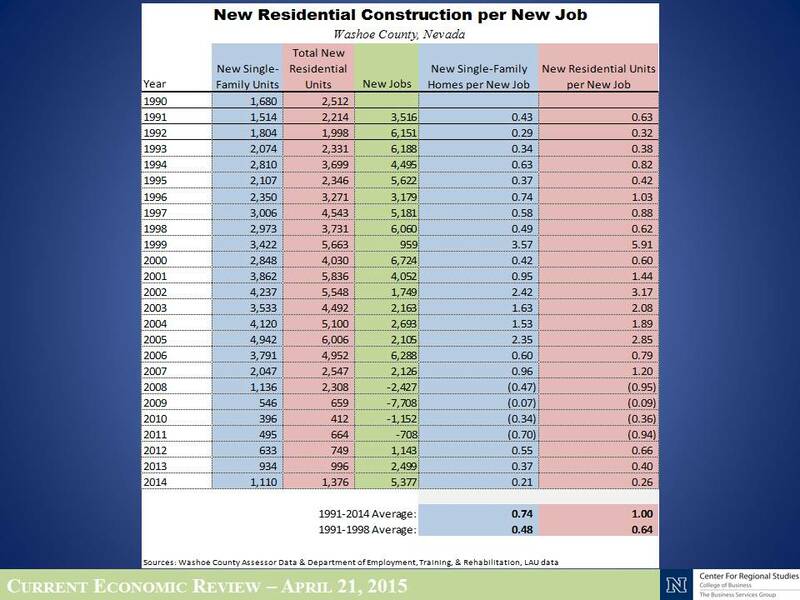 On an average annual basis, 2014’s average of 202,775 is 3.2% higher than 2013’s average of 196,425. The annual average employment growth of 3.2% in 2014 is the highest growth since 2006 (3.7%). Industries with the largest employment gains between December 2014 and December 2013 include Professional & Business Services (2,500 jobs), Education & Health Services (600 jobs), State Government (300 jobs), Leisure & Hospitality (100 jobs), and Financial Activities (100 jobs). Industries with a reduction in jobs during this period are Construction (-600 jobs); Local Government (-500 jobs); Wholesale (-300 jobs), Retail (-200 jobs); Transportation, Warehousing, & Utilities (-200 jobs); Federal Government (-100 jobs), and Other Services (-100 jobs). After six years of gross gaming revenue decline between 2007 and 2012 (year over year), gaming revenues increased in 2013 by 3.5%. Although December 2014 gaming revenues posted a 9.0% increase over December 2013, the annual revenue declined 0.5% in 2014 and emphasizes the unpredictable nature of gaming revenue. 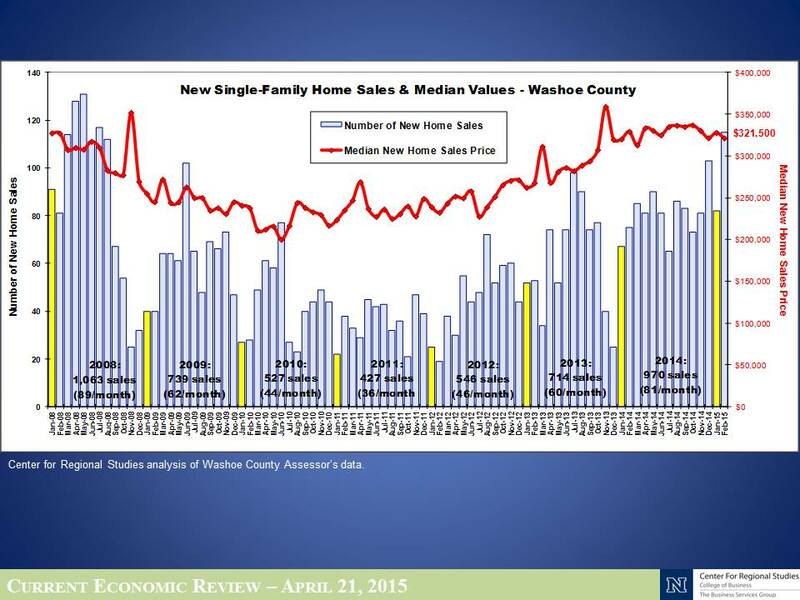 Through November 2014, Washoe County taxable sales have now experienced 23 straight months of positive year-over-year growth since January 2013. During this period taxable sales have increased between 3.6% (Aug-14/Aug-13) and 13.1% (Dec-13/Dec-12), with six of the months posting gains in the double-digits. The industries with the largest taxable sales in Washoe County continued to report growth in sales between November 2013 and November 2014. These include Motor Vehicle and Parts Dealers with sales of $76.53 million (13.4% increase), Food Services and Drinking Places with sales of $75.21 million (5.1% increase), and General Merchandise Stores with sales of $69.18 million (1.7% increase). According to the Northern Nevada Regional MLS, the existing single-family median home value of $265,000 (December 2014) represents a 14.2% increase over December 2013, but only a 0.2% increase over November 2014. November’s median value of $265,000 is the highest median since April 2008 ($275,000), but is still $95,000 less than the peak of January 2006 ($360,000). Average appreciation rates for the Reno-Sparks region (calculated between 1990 and 2001) are 1% per quarter, or 4% per year. At this average appreciation rate, the median home value in the 4th Quarter 2014 would have been $276,235. As a result, the current home value of $265,000 remains under-valued by more than $10,000, although the comparison is somewhat skewed by the lack of homes currently sold in the higher price ranges compared to the mid-2000s. 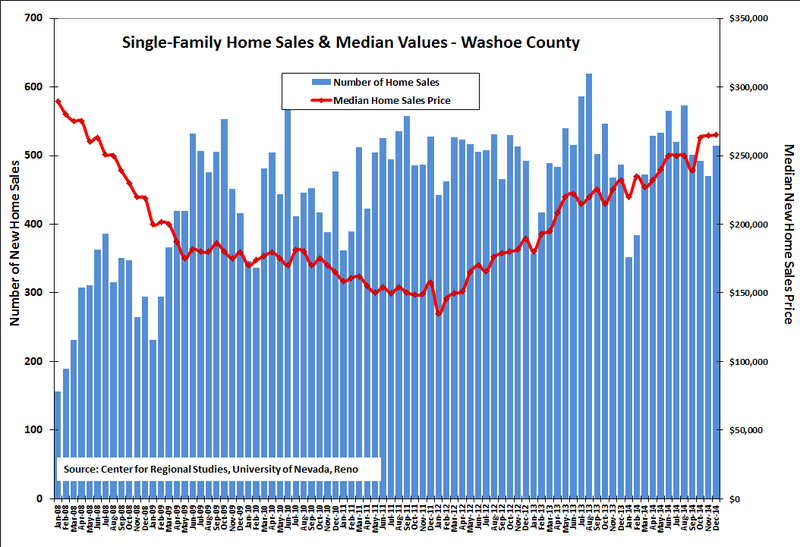 According to the Northern Nevada Regional MLS, 514 existing single-family homes were sold in the Washoe County in December 2014, compared to 487 homes sold in December 2013 and 470 homes in November 2014. For the year, a total of 5,905 single-family homes were sold in 2014, a 1.7% decrease over 2013 when 6,009 single-family home were sold. The largest amount of existing single-family homes sold through MLS occurred in 2012 (6,016), almost double than those sold in 2007 (3,307) when the Great Recession began. As vacancy data are reported quarterly, no new data has been published since our December blog. As a result, the below entry is a copy of the December information for the 3rd Quarter 2014. The office market vacancy rate peaked in the 3rd quarter 2010 with a 4QMA of 21.6%. Office vacancy rates declined to a post-recession low of 18.0% in the 3rd quarter 2012 before climbing to 19.2% by the 3rdquarter 2013. 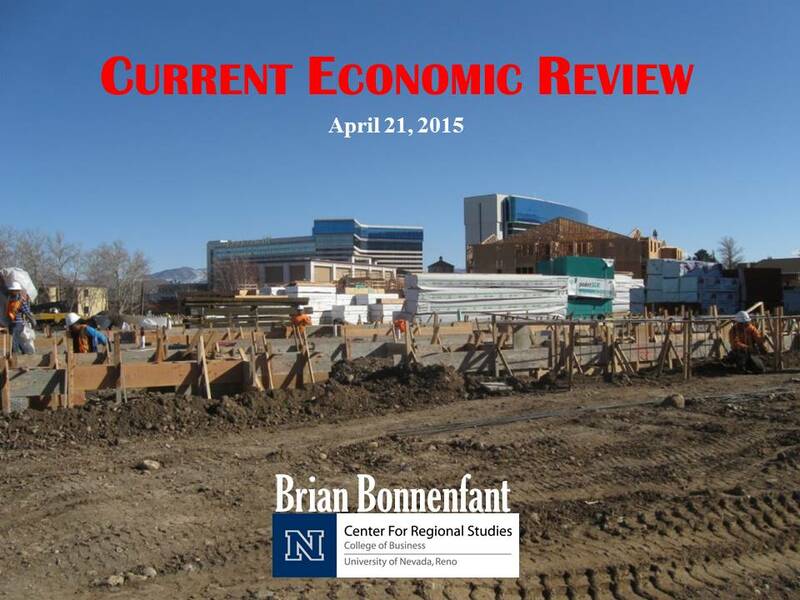 A year later, by the 3rd quarter of 2014, vacancy rates fell to a 4QMA level of 17.4%. The industrial market vacancy rate peaked in the 2nd quarter of 2010 with a 4QMA level of 13.7%. Rates fluctuated during the next few years before reaching a new peak in the 4th quarter of 2012 with a 4QMA level of 13.4%. By the 3rd quarter 2014, 4QMA levels fell to 8.0%, compared to the 4QMA level of 11.8% a year prior, 3rd quarter 2013. 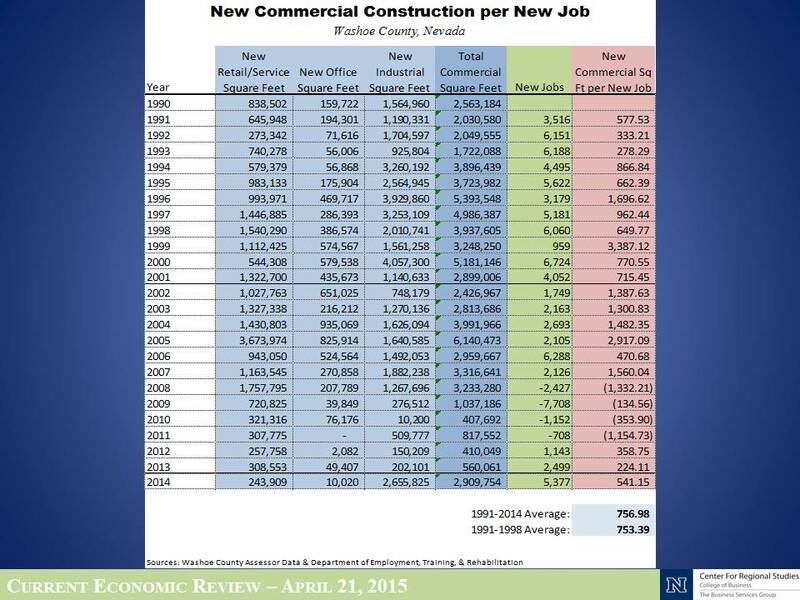 This is driven by the increased demand for industrial space and supported by increases in manufacturing employment. 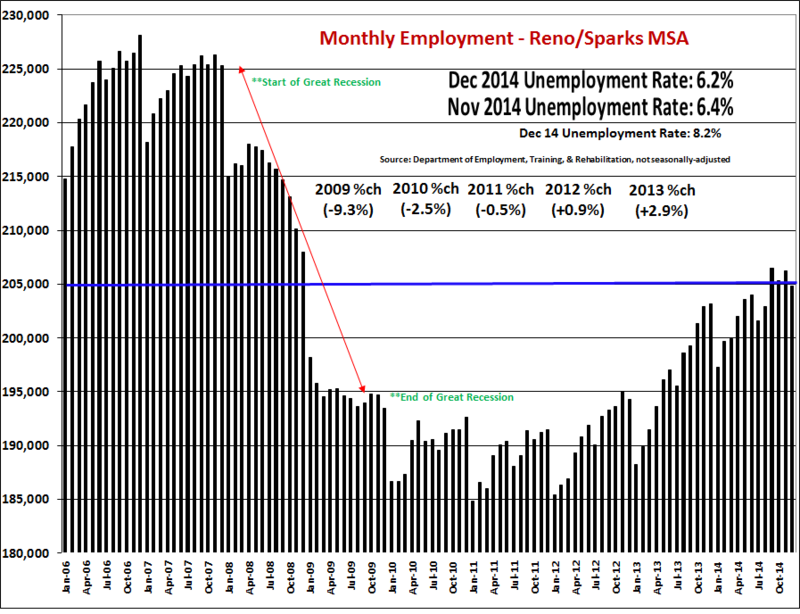 Monthly Reno-Sparks MSA employment trends (year over year) have seen consistent positive employment growth since March 2012. According to preliminary estimates from Department of Employment, Training, & Rehabilitation (DETR), November 2014 employment is 206,200, a 1.6% increase (3,300 jobs) over November 2013. The November 2014 employment is higher than for any November employment total since 2008, but the November 2014 employment is 300 jobs less than the peak month (September) in YTD 2014. The November 2014 employment level of 206,200 represents an increase of 21,400 jobs since the lowest level of employment post-2005 (January 2011, 184,800 jobs), but remains 21,900 jobs less than the region’s peak employment (December 2006, 228,100 jobs). Industries with the largest employment gains between November 2014 and November 2013 include Professional & Business Services (3,200 jobs); Education & Health Services (500 jobs); State Government (200 jobs); Leisure & Hospitality (100 jobs); Transportation, Warehousing, & Utilities (100 jobs); and Financial Activities (100 jobs). Industries with a reduction in jobs during this period are Wholesale (-300 jobs), Retail (-200 jobs); Manufacturing (-100 jobs), Construction (-100 jobs); Federal Government (-100 jobs), and Other Services (-100 jobs). After six years of gross gaming revenue decline between 2007 and 2012 (year over year), gaming revenues increased in 2013 by 3.5%. 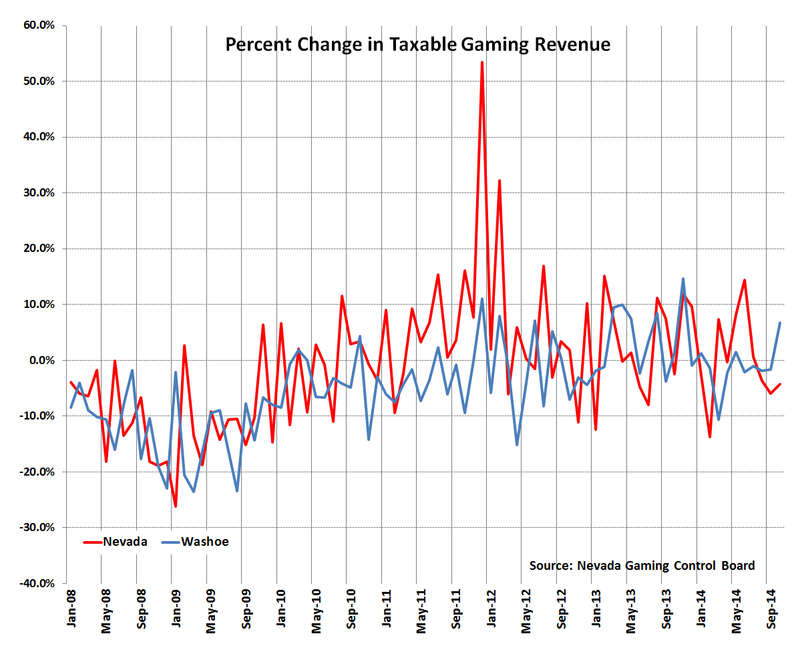 Through November 2014, however, gaming revenue has declined 1.3% compared to the same period in the previous year, and down 0.2% year-over-year for the month. 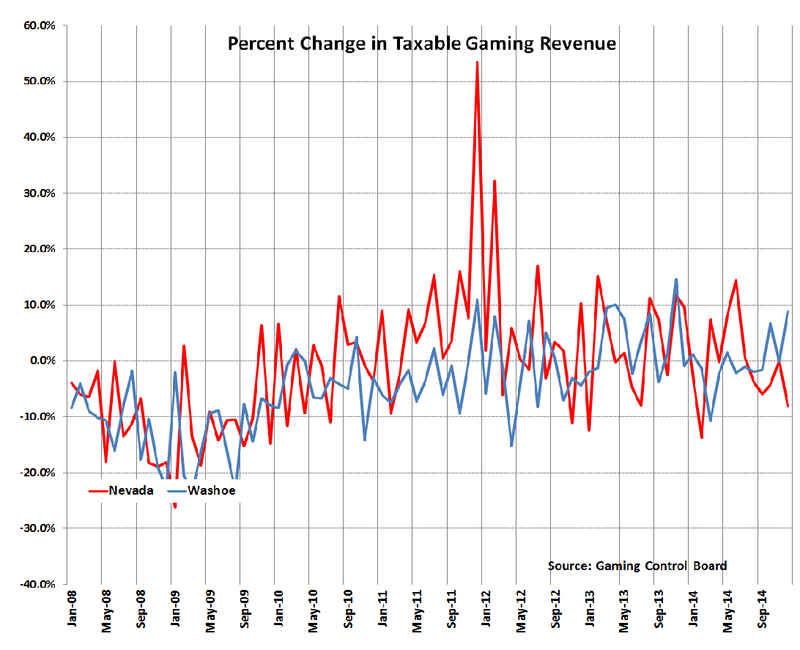 Emphasizing the unpredictable nature of gaming revenue, the year-over-year change for October is +6.8%. 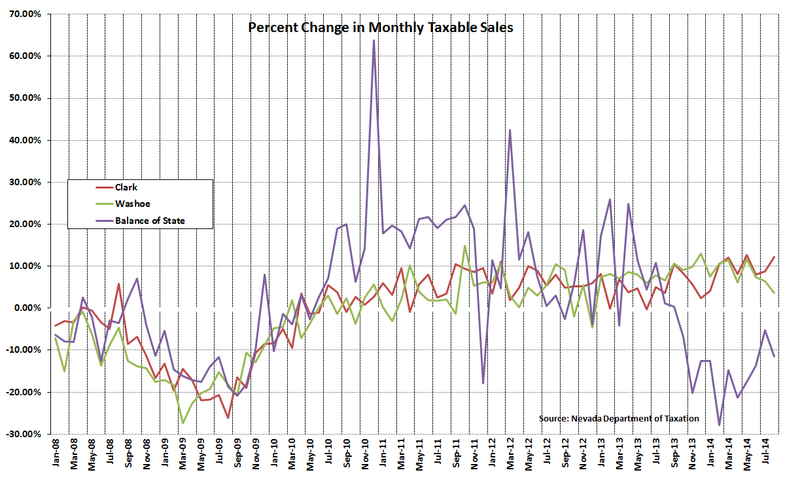 Washoe County taxable sales have now experienced 22 straight months of positive year-over-year growth since January 2013. During this period taxable sales have increased between 3.6% (between August 2013 and 2014) and 13.1% (between December 2012 and December 2013), with six of the months posting gains in the double-digits including October 2014 (10.8%). 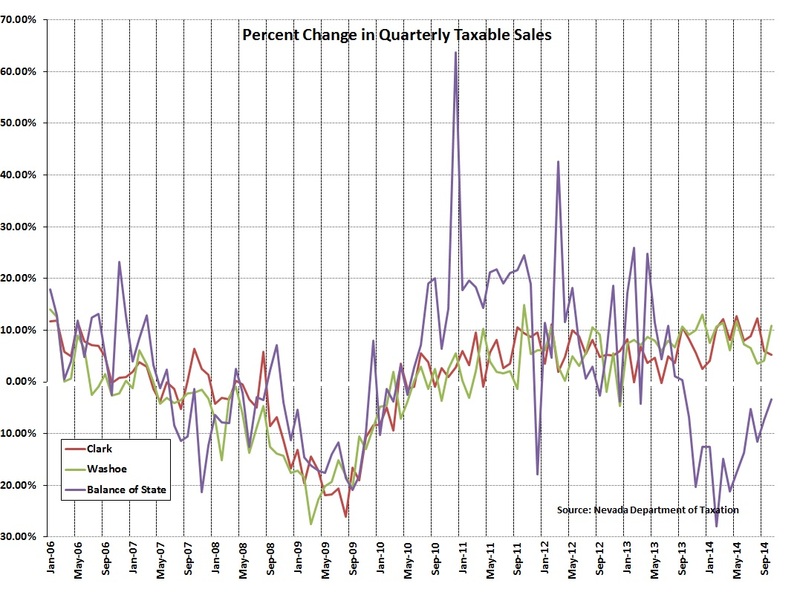 The industries with the largest taxable sales in Washoe County continued to report growth in sales between October 2013 and October 2014. These include Food Services and Drinking Places with sales of $81.59 million (10.5%); Motor Vehicle and Parts Dealers with sales of $70.68 million (1.0%); and General Merchandise Stores with sales of $58.23 million (3.7%). 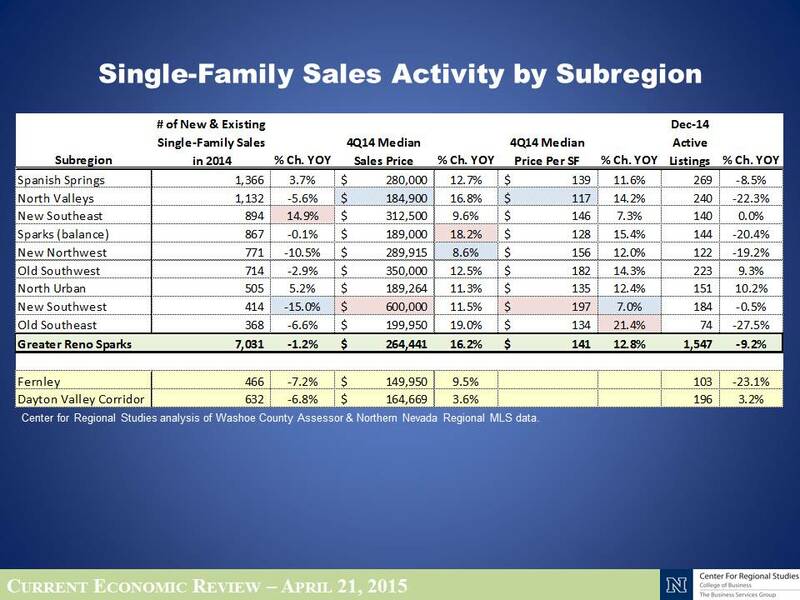 According to the Northern Nevada Regional MLS, the existing single-family median home value of $264,450 (November 2014) represents a 17.3% increase over November 2013, and a 0.6% increase over October 2014. November’s median value of $264,450 is the highest median since April 2008 ($275,000), but is almost $100,000 less than the peak of January 2006 ($360,000). Average appreciation rates for the Reno-Sparks region (calculated between 1990 and 2001) are 1% per quarter, or 4% per year. At this average appreciation rate, the median home value in the 4th Quarter 2014 would have been $276,235. As a result, the current home value of $264,450 remains under-valued by more than $10,000, although the comparison is somewhat skewed by the lack of homes currently sold in the higher price ranges compared to the mid-2000s. 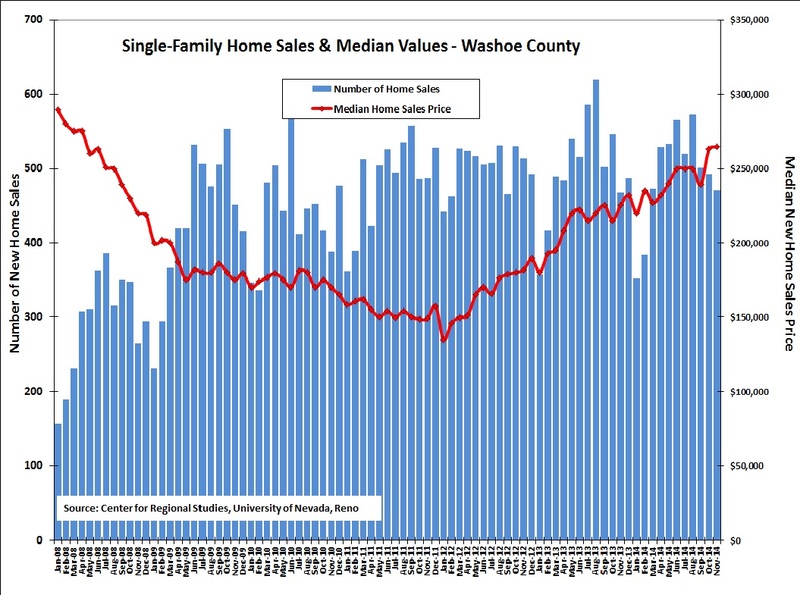 According to the Northern Nevada Regional MLS, 470 existing single-family homes were sold in the Washoe County in November 2014, compared to 468 homes sold in November 2013 and 492 homes in October 2014. Through November, a total of 5,391 single-family homes have been sold in 2014, compared to a slightly higher number of 5,522 during the same period in 2013. Again, we would like to thank the Center for Regional Studies at the University of Nevada, Reno for help with data and analysis. 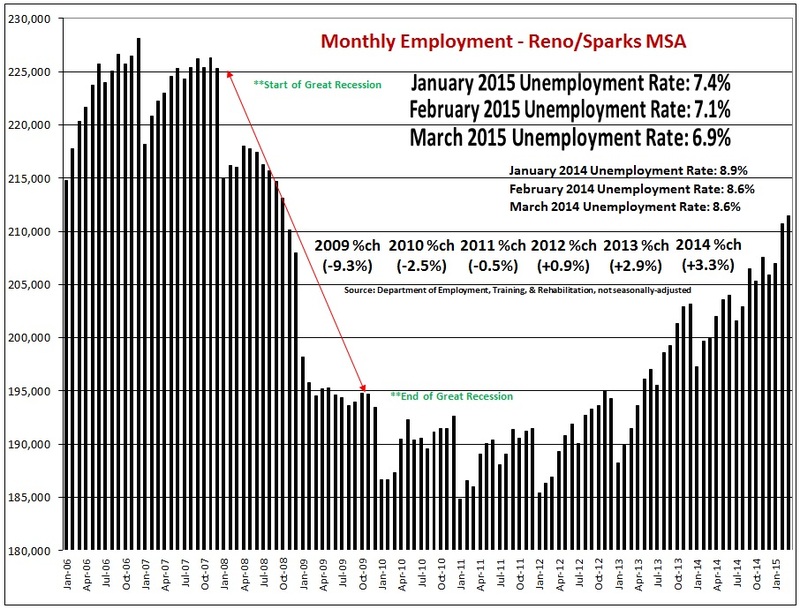 Monthly Reno-Sparks MSA employment trends (year over year) have seen consistent positive employment growth since March 2012. According to preliminary estimates from Department of Employment, Training, & Rehabilitation (DETR), October 2014 employment is 205,300, a 2.0% increase (4,000 jobs) over October 2013. The October 2014 employment is higher than for any October employment total since 2008, but the October 2014 employment is 1,200 jobs less than the September 2014 total. The October 2014 employment level of 205,300 represents an increase of 20,500 jobs since the lowest level of employment post-2005 (January 2011, 184,800 jobs), but remains 22,800 jobs less than the region’s peak employment (December 2006, 228,100 jobs). 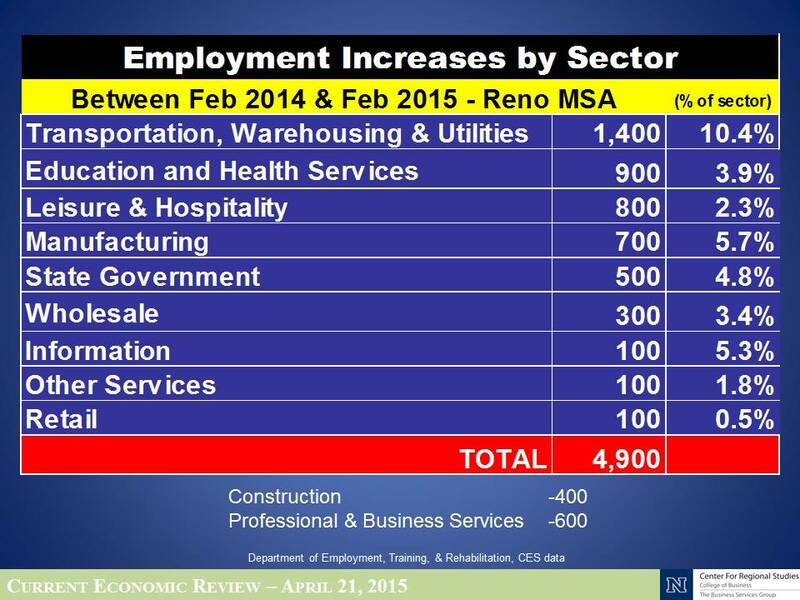 Industries with the largest employment gains between October 2014 and October 2013 include Professional & Business Services (2,500 jobs); Leisure & Hospitality (600 jobs); Education & Health Services (600 jobs); Retail (400 jobs); State Government (400 jobs); Construction (200 jobs); Transportation, Warehousing, & Utilities (200 jobs); and Financial Activities (100 jobs). Industries with a reduction in jobs during this period are Manufacturing (-400 jobs), Wholesale (-300 jobs), Federal Government (-100 jobs), Local Government (-100 jobs), and Other Services (-100 jobs). 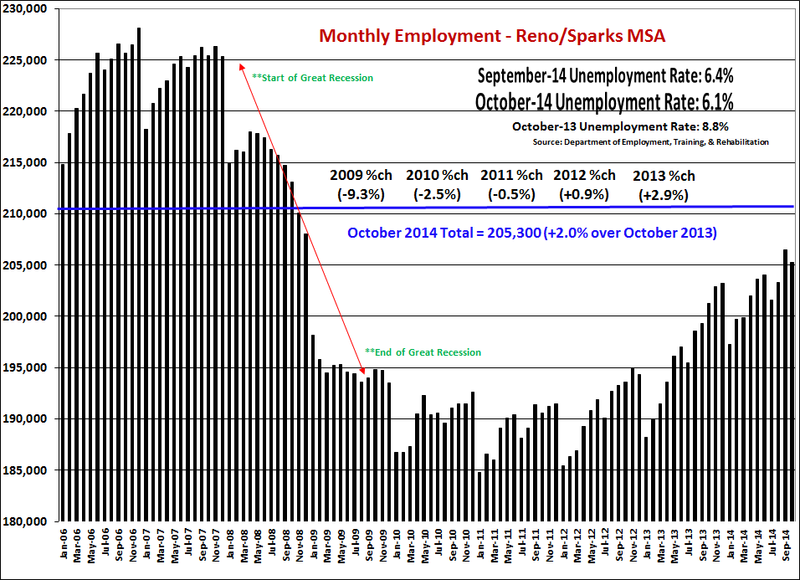 *It should be noted that DETR revised September 2014 job estimates from 210,508 as posted in our November blog to 206,500 as reflected in the above graph. After six years of gross gaming revenue decline between 2007 and 2012 (year over year), gaming revenues increased in 2013 by 3.5%. 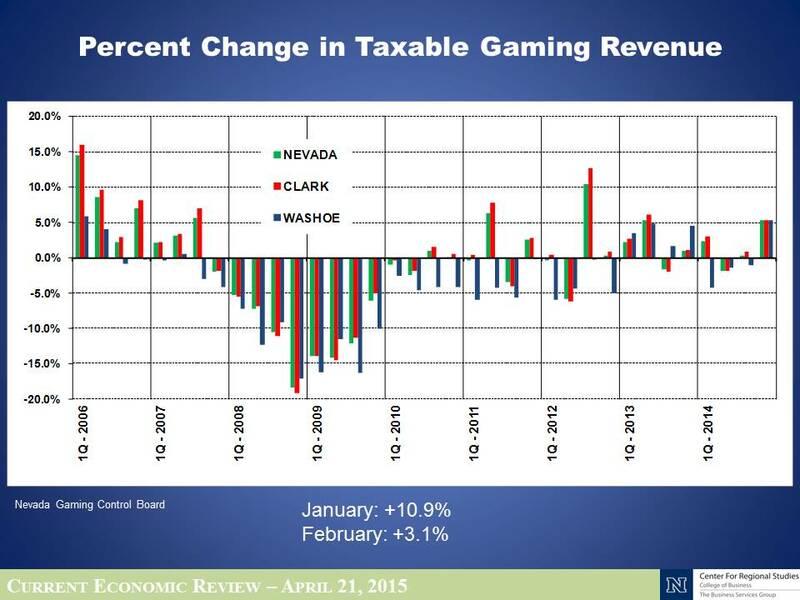 Through October 2014, gaming revenue has declined 1.3% compared to the same period in the previous year. 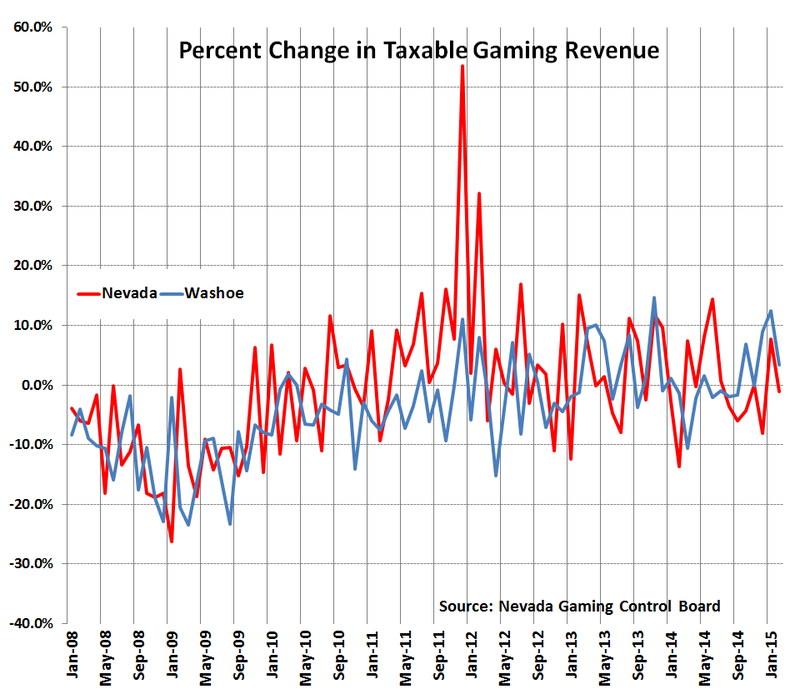 Emphasizing the unpredictable nature of gaming revenue, the most recent month-over-month change (October) is +6.8%. *It should be noted that Nevada Department of Taxation had not released September 2014 taxable sales data as of the date of this blog. As a result, we will again discuss August 2014 data. 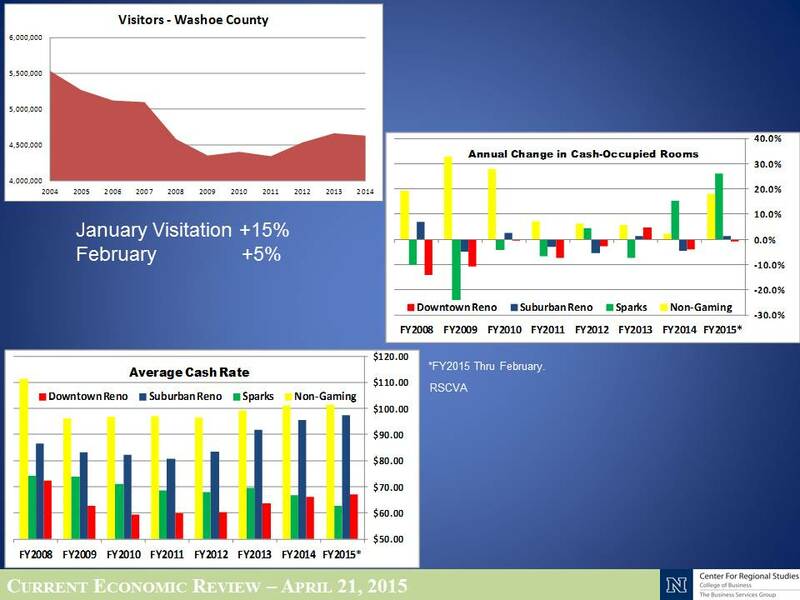 Washoe County taxable sales experienced positive growth over a 20-month period since January 2013. During this period taxable sales increased by as high as 13.06% between December 2012 and December 2013. August 2014 sales increased by the lowest amount during this period of 3.58% over August 2013. 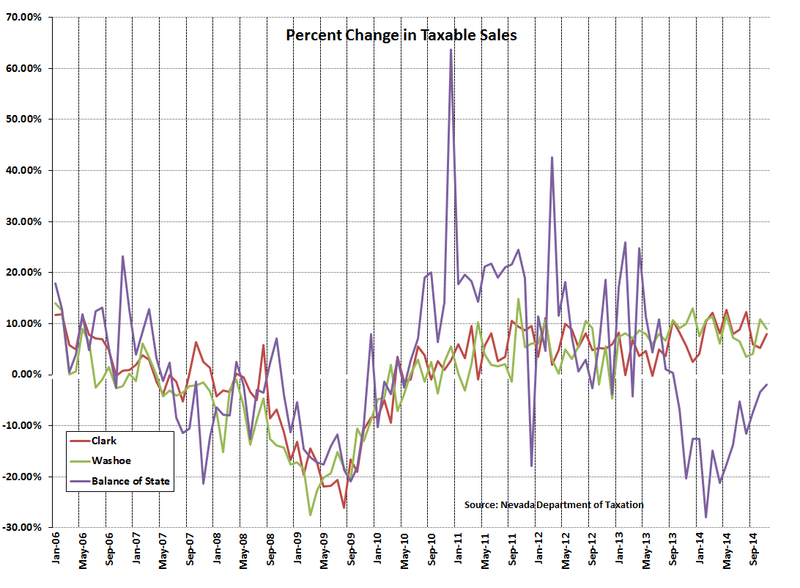 The largest taxable sales industries in Washoe County continued to report growth in sales between August 2013 and August 2014. These include Food Services and Drinking Places with sales of $89.15 million in August 2014 and growth of 5.1%; Motor Vehicle and Parts Dealers with sales of $87.99 million and growth of 5.4%; and General Merchandise Stores with sales of $62.84 million and growth of 2.0%. According to the Northern Nevada Regional MLS, the existing single-family median home value of $262,750 (October 2014) represents a 22.2% increase over October 2013, and a 9.9% increase over September 2014. October’s median value of $262,750 is the highest median since June 2008 ($263,000), but is almost $100,000 less than the peak of January 2006 ($360,000). 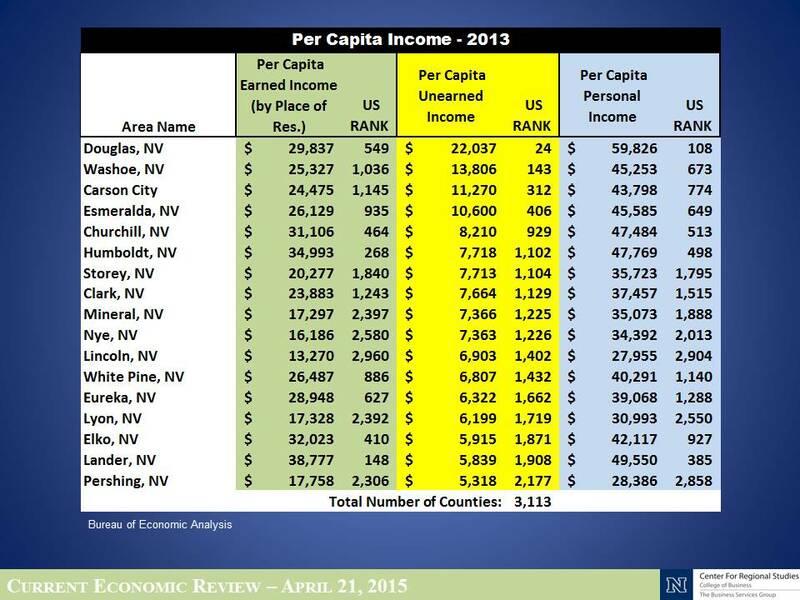 Average appreciation rates for the Reno-Sparks region (calculated between 1990 and 2001) are 1% per quarter and 4% per year. 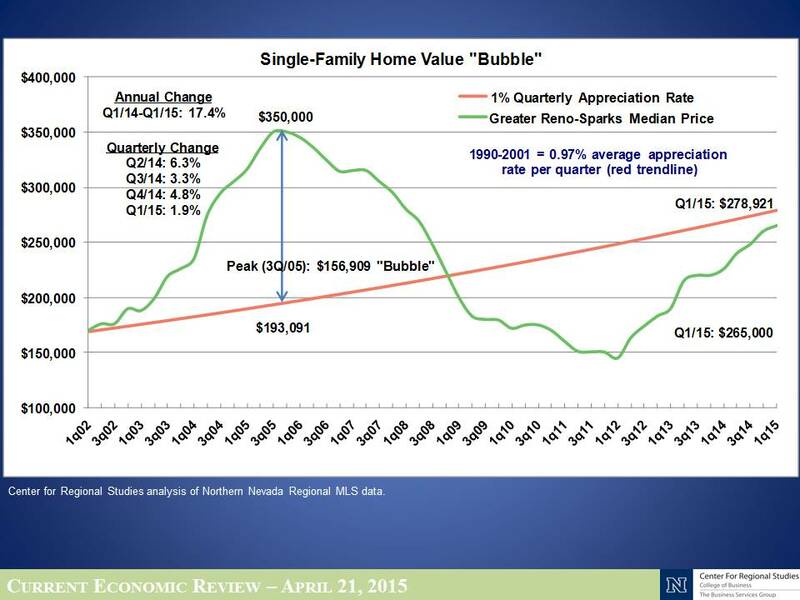 At this average appreciation rate, the median home value in the 3rd Quarter 2014 would have been $273,574. As a result, the current home value of $262,750 remains under-valued by $10,000, although comparison is somewhat skewed by the lack of homes currently sold in the higher price ranges compared to the mid-2000s. 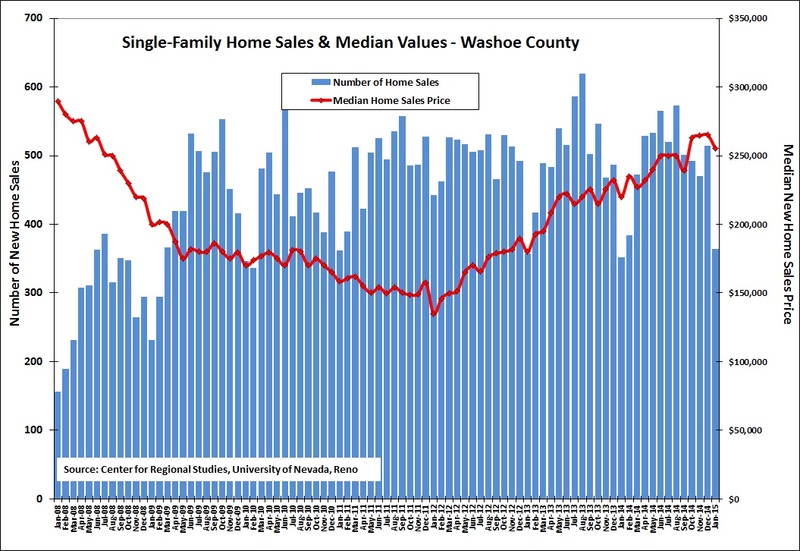 According to the Northern Nevada Regional MLS, 492 existing single-family homes were sold in the Washoe County in October 2014, compared to 546 homes sold in October 2013 and 502 homes in September 2014. Through October, a total of 4,921 single-family homes have been sold in 2014, compared to a slightly higher number of 5,054 during the same period in 2013. Having combined single-family home sales and values data into a single entry, we were left with room for another indicator. Since we have been covering the residential real estate market, it made sense to also focus on the commercial market, especially in terms of market vacancies. 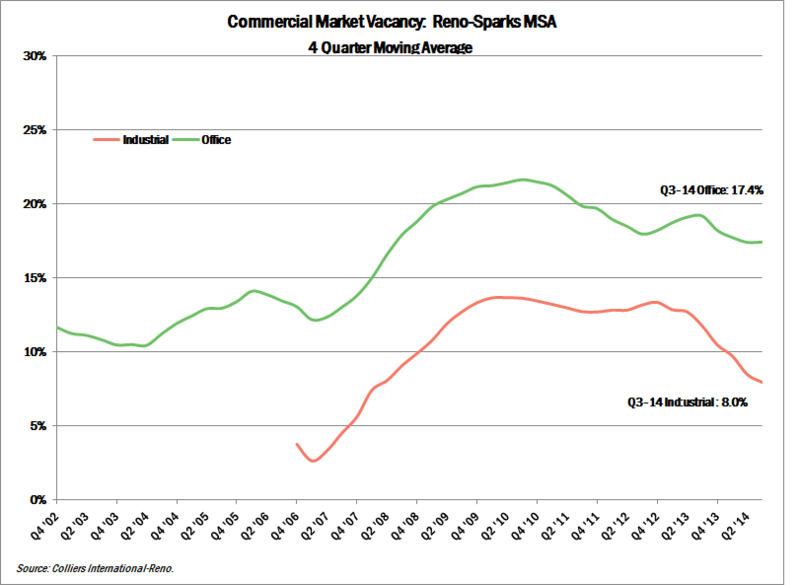 Using quarterly data available from Collier’s International Reno office, vacancy rates for office space are available starting in the 1st quarter 2002; vacancy rates for industrial properties are available starting 1st quarter 2006. As data are shown using a 4-quarter moving average (4QMA), the below graph shows office vacancy rates starting 4th quarter 2002 and industrial vacancy rates starting 4th quarter 2006. The office market vacancy rate peaked in the 3rd quarter 2010 with a 4QMA of 21.6%. Office vacancy rates declined to a post-recession low of 18.0% in the 3rd quarter 2012 before climbing to 19.2% by the 3rd quarter 2013. A year later, by the 3rd quarter of 2014, vacancy rates fell to a 4QMA level of 17.4%.